All members the CME Congregation (who are not considered Clergy) are members of the Laity / Lay Ministry Council and as members – your input is needed. The purpose of the Lay Ministry Council organization is to promote Christian stewardship, layman work, financial support, full payment of budget, adequate support of the ministry of the church, proper provisions for other Church obligations, personal evangelism, lay speaking, training of church officers, and proper attendance to and care of all the other various interest of the church in cooperation with other departments of the church. The Lay Ministry Council serves in a supportive role. It serves as a forum where all issues of the Church may be discussed openly and freely. Auxiliary presidents and chairpersons may use this meeting to request support and assistance with projects and functions. It is the focal point for problem solving and identifying needs of the Church. 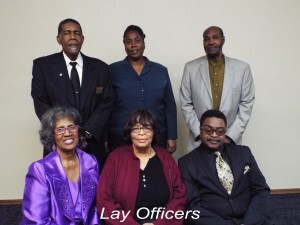 For more information about the Lay Ministry Council, please contact Bro. Lee Johnson, President.